I've had some really awesome sponsors this month, so I feel super duper lucky. Other than the beautiful Mona Dot, who I mentioned yesterday, I also have three fantastic other bloggers and brands to introduce you too. Annatha, the blogger behind Prattle and Froth, is a book-loving Harry Potter fan who loves the smell of suncream. And she has this hilarious photo on her blog! 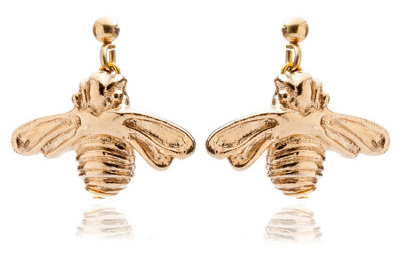 I absolutely love these bee earrings from Sujuu, an ethical accessories brand. They also sell matching necklaces and bracelets, as well as lovely scarves. Bonjour, Blogger is a really useful site that aims to support bloggers with advice on how to make their blog the best it can be. With tutorials on everything from creating a blog button to hosting a giveaway, it's a great resource for both new and experienced bloggers. Would you like to see your blog or brand on Becky Bedbug next month? I'm now taking sponsorship for June, and prices start from just $6/ £4 so check out my sponsorship page if you're interested.